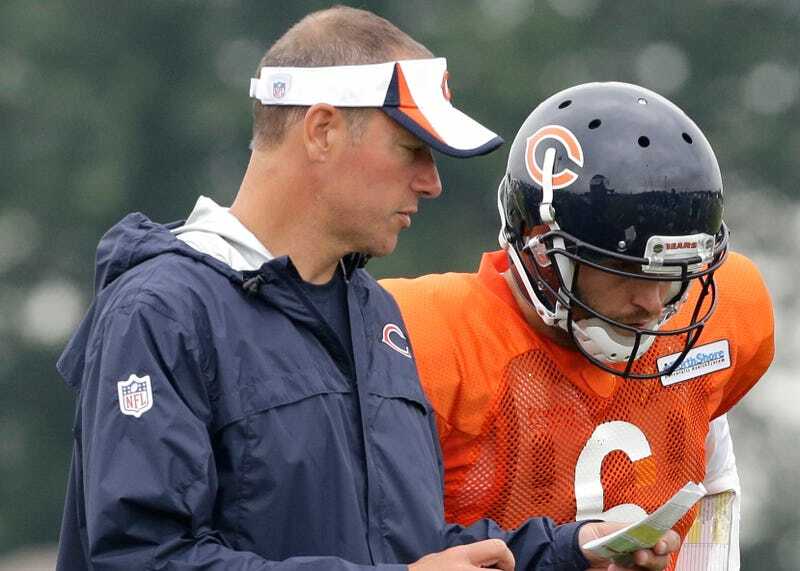 Bears offensive coordinator Aaron Kromer stood up in front of the offense earlier this week, and offered an emotional apology for telling an NFL Network reporter in a conversation that was later reported on TV that Jay Cutler's play has "killed" the Bears. Cutler, according to the Chicago Tribune, "shook his head" during the apology. "I'm still kind of trying to sort my way through this to be honest," one player said. "It's one of the most fucked up things I have ever seen." "It's a fucked up situation," another player said. Kromer confirmed he talked with NFL Network's Ian Rapoport as he left the stadium following last Thursday's Bears loss to the Cowboys. Sunday morning, on both Twitter and the NFL Network's pregame show, Rapoport reported on the Bears' growing frustrations with Jay Cutler, and the franchise's regret over the big contract extension it signed him to after last season. "I'm told by Bears sources that there is a serious case of buyer's remorse for Jay Cutler and signing him to that huge contract that is, by the way, guaranteed through next year. Jay Cutler simply has not played well enough, and it's not just in the passing game: his refusal to check out of bad run plays is absolutely killed this team, and there is a serious case of frustration inside the organization about the way Jay Cutler [has] played. "I'm told they considered benching him against Tampa Bay when they were shut out [at halftime]." In the meeting on Monday, Kromer admitted to the Bears offense that he had spoken with Rapoport, though he "adamantly denied" saying anything about the team having "buyer's remorse" for re-signing Cutler. Maybe that's believable, because Rapoport went on to report that defensive coordinator Mel Tucker is expected to be fired after the season—a piece of information that Kromer wouldn't have. So The Good Ship Bears has sprung more than just the single leak. It's a disaster of a season for a team that was supposed to be its usual "pretty good, not great" self. The Bears are 5-8, but have looked listless since giving up 50-plus points each to the Patriots and Packers on either side of their bye week. Meanwhile, Chicago's offense has yet to cross the 30-point barrier this year. Cutler, whose deal is guaranteed for next season, could certainly be traded for huge cap savings. Head coach Marc Trestman is 13-16 since taking over, and his job is certainly not assured—though he made sure to offer Cutler the strongest of endorsements earlier this week. Both Cutler and Kromer have their mandatory media availability sessions later today. Should be fun.